When I visited Europe to teach Shogi last month, I heard there were not many books written in English about Shogi tactics and strategies. 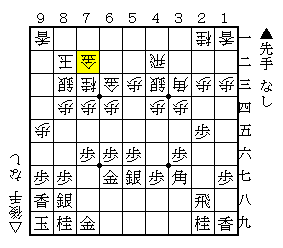 I felt the need of a joseki guidline at that time and decided to write this blog little by little. 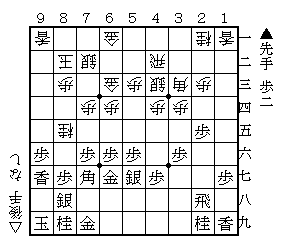 I'm afraid my English is not so good, but I am glad if it will be of any help to people learning Shogi overseas. The 4th-file rook is a popular strategy among amateur players. 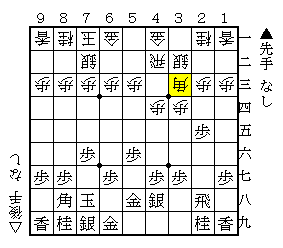 I think it is easy to remember that the rook is placed on 4b and forming Mino Castle . However, the use of this strategy has declined in recent professional official matches because there is a countermeasure, Anaguma. I'd like to introduce a lot of variations related to 4th-file rook vs. Static rook games. 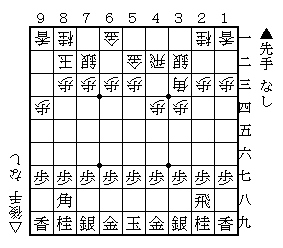 First of all, castling is one of the most important things in Shogi. Gote's (white) formation is like this (Diagram). The shape around the king is called Mino Castle (Minogakoi in Japanese). It's often said the king should be defended with two golds and one silver. Almost all castles, including Mino Castle, fit into this case. Of course, there is an exception. The advantage of this castle is that it is well guarded when attacked from the side. And the disadvantage is that it is not strong when attacked from above, such as edge attack. S-7b means gote attempts to build Mino Castle quickly. K-7b is also considered as the option, which still has the possibility of building Anaguma. From here, sente's (black) formation is roughly divided into two parts, depending on how to use the silver. S-5g which advances the right silver tends to become a slow game and S-6h, S6h-5g which advances the left silver goes for a rapid attack from 3rd or 4th-file basically. Sente's castle is called Anaguma, and gote's castle is called High Mino Castle (or High Mino simply, Takamino in Japanese) which is the developed form of Mino Castle. It is said Anaguma is the strongest castle because there is no square to be checked. The player can attack fiercely without caring about his own camp in the endgame. But, the bad point is that it takes a long time to be built. Instead of G-6g, placing the gold on 7h is also considered. It's called Anaguma as long as the king is on 9i. High Mino Castle is stronger against being attacked from above than Mino Castle because of the gold on 6c, but weaker from the side. The knight on 7c would be used as an attacking piece, for example, if gote has a pawn, there would be the attack like P-9f, Px9f, P*9g, Lx9g, N-8e (Diagram). This castle is able to develop further into Silver Crown. Gote's castle is called Silver Crown (Ginkanmuri in Japanese), which is characterized by the silver being on 8c at the head of the king. This castle is the strongest of these three castles when attacked from above. Your English is really very good, thank you very much for being the first to provide such high-level shogi content in English :) Very much appreciated! As I'am a 4th file rook player, it's a really helpful article, big thanks! And as far as I know it is the first time that a professional publishes such content in English!! Greetings from Germany, Jochen Drechsler. Thank you for your comments. I hope my English will improve by writing this blog. Lukas from Slovakia here! Wow, your english is great! This blog is amazing. Big thumbs up! Thank you for taking your time to write it. Lukas! Thank you very much during our stay in Slovakia. I will introduce a lot of strategies on this blog. Great blog. It's really good to read advices from a professional player. I hope you will continue this as long as you can and I wish I would be able one day to see you in real life \o/ ! Good luck from UK (Benjamin, a French player). English is perfect, please continue adding more and more useful stuff like these!! Question: What if sente exchange Bishop as soon as in the very 1st chance available when the Bishop path is opened on move no.3? Wouldn't this then drive the game out of massive preparation of gote in normal 4th-file-rook theory? I can't find enough resource online that dealing with this line. Do you have any? If you want to avoid gote's normal 4th-file rook, exchanging bishop at #3 would be a good strategy. But, as it's one turn loss, sente will play like gote. Therefore, there are not many theories. Thanks a lots. I see your point here! This is a great job ! Thank you a lot ! If you will continue this thing your name will remain in the history books ! I'm glad if you keep on reading. 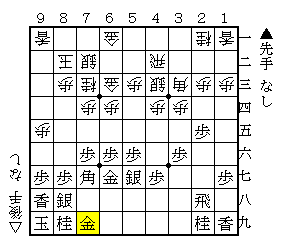 I'm so glad if you translate my articles into Spanish and more people play Shogi at your club. Hello, i have a question whats to do from now when you build silver crown vs anaguma?